After covering the attractions in Shillong, we continued our journey towards Cherrapunji – The Wettest Place on Earth for a long time. It was an absolutely marvelous weather when we set on road towards the next destination after a lovely time spent in Shillong. Another day in the company of gang with the day ahead full of masti had us excited. For sake of completeness it would be best if you read the first part of this excursion – the Shillong Visit at Scotland of the East amidst Abode of Clouds - Shillong. Shillong to Cherrapunji is about 60 kilometers in distance and the hilly terrain takes it around 1 and a half hour time in general. However, it was going to be different case with us who seemed to be determined on the saying that journey is more important than destination. We took our own sweet time through the distance having frequent breaks for enjoying the picturesque scenery all around. Hills and valleys with clouds hovering across was simply a breathtaking view and was something which was only a luxury for us from the plains. Singing, talking, photographing and enjoying the entire stretch of the journey, we finally reached Cherrapunji after about two and a half hour drive and it was already post lunch by the time we crossed the peripheries of the town. We realized we had limited time in hand as driver had already warned of the requirements to leave by evening, we got onto out work – taking most out of the city in the time we had. Cherrapunji's has a place in the Guinness Book of Records for being a place with heaviest rainfalls across the world. Situated at about 4500 feet above sea level, this home of Khasi clan is a year round tourist destination. The climate is pleasant for most part of the year and visitors can enjoy the ridges and crests amidst the beauty of nature at any point of time. There is no month of the year when the place does not get rains and hence can truly be called a land of one season – monsoon! With average rainfall over 11,000 mm annually, this small hill-town of Meghalaya can thus definitely be called the “Capital of Rains” in the world. We may know it as Cherrapunji, though it was not always that the town had its present name. Earlier the place was called Sohra, which was pronounced "Churra" by the British and was an in-formal capital for the Khasi tribe. Gradually the place got its current name which actually means “land of oranges”. While entering the town the first glimpse of the beauty of nature was offered to us at our first stop - Mawkdok Dympep Valley. The lush green slopes with occasional covering of clouds moving from one hill to other right infront of eyes presented a marvelous view. Ridges of the hills and then deep gorges in far sight were a pleasure to eyes and had it not been a tight schedule we would have spent a lot of time with that glance in our eyes. Forest department has provided a view point for the site which definitely does justice to the beauty on offer. Post this we covered Dain-Thlen Falls which derive their name from a Thlen or a gigantic snake that dwelt in a nearby cave. Our next stop was Mawsmai Cave, one of the few caves in the area that have been fully lighted and developed as tourist spots. Limestone caves with stalactites & stalagmites, these are called Krem Pubon in local language. This 150 m long natural formation starts with wide and spacious entrance but later only provides low stooping passages for tourists but that does not deter anyone from even experiencing the seeming impassable parts. The wetness of the region does not leave you even inside these structures where one could often find their feet submerged in water or droplets pouring from above. Towards the end of the cave, there is a lot of greenery and the exit is practically amidst bushes. After these caves we covered a couple of other waterfalls and then proceeded to our last destination of the day. Before that though we also visited the place which is technically what makes this town the wettest place – Mawsmai Falls. Along with falls lesser in height but no less alluring, the spectacular, cascading 1,035-ft-high Mawsmai Falls-the are fourth highest in India. Finally after about half an hour of travelling we entered the boundaries of the Eco Park. This is an ecological reserve established by the Meghalaya government and hosts a number of indigenous and hybrid orchids. However, it is not that this which makes the place interesting. The Eco Park offers beautiful view of distant Sylhet Plains of neighboring Bangladesh. Moreover, the place provided close view of a serene waterfall reaching a deep gorge and this was what made us decide to spend good time there. The view of water flowing through the steep slope disappearing from eyes before hitting the deep gorge was nothing less than breathtaking. The cool breeze carrying the droplets from this water made the entire area heavenly and the clouds around were simply a bonus for us. Tired after the long two days we stayed laying there on the rocks, chatting about the wonderful weekend we were about to end and enjoyed the site to its fullest. None of us wanted to leave the place when someone from us reminded that we still had the return journey to make and everyone got up hesitantly. We took one last view of the perfect setup on earth and bid the region a good-bye. We began our return journey to Guwahati with each one promising themselves to return to the region in future with more time in hand and plan to go deeper into the place. 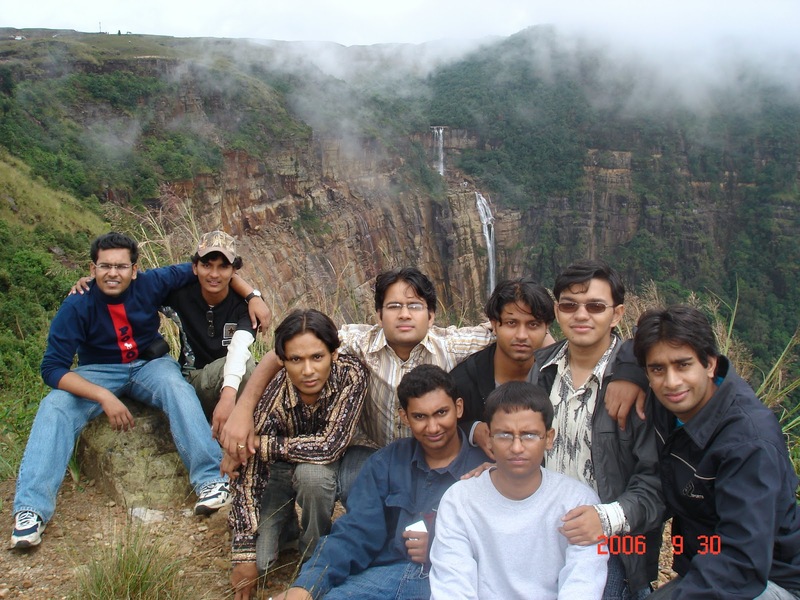 Planning a trip to Cherrapunji and want a guide in planning? Have you had a trip with friends recently? Have views on this post or blog in general? Shoot in your views, appreciation and criticism in the comments !! And do not forget to subscribe to the email feed - look in the footer for the form. Nice information. from where you got that music ? Took the sound track from internet. It's Khasi music.